EXTRA VIRGIN OLIVE OIL: The hills of the Ligurian westside, shaped by the terraces of olive trees that our ancestors planted, testify to the strong ties between our people and this extraordinary tree. Thanks to an ideal climate, the Taggiasca olive tree gives us one of the best olive oils in the world, with slight variances in taste and colour according to the harvest time. RED SAUCES: Our local tomatoes have always been the base for refined pasta sauces, whether created in the fishing villages or in the Ligurian countryside. We offer a wide selection of sweet and tasty sauces. OLIVES: Up until now we do not exactly know whom we should thank for introducing the cultivation of the Taggiasca olives into Western Liguria. According to some, it had been started by the Phoenixes, for others the Benedettino monks who established their residence in Taggia. Whichever opinion we consider, that little black olive with a delicate taste and a soft fruity flavour, is today a real symbol of Ligurian cuisine. Whether in brine or in oil, whole or stoned, Taggiasca olives are present in all the main dishes from Liguria. MEDITERRANEAN SPREADS AND CREAM: Olives spreads and vegetables creams are always on hand in the typical Ligurian kitchen. These special products can transform any simple dish into something unique. PESTO LINE: The unmistakable fragrance of fresh Genoese DOP basil and the sweet taste of our extra virgin olive oil are the base of the inimitable Genoese pesto of Casa Bruna. Depending on the season, our grandmothers added special ingredients like a handful of sundried tomatoes or artichokes, or even Taggiasca olives. This is how the Coloured Pesto line originated. WHITE SAUCES: Ancient recipes from the Ligurian countryside make up an unexpected variety of fanciful combinations. FISH SPECIALITIES: The two faces of Liguria, the countryside and the seaside, came together to create delicious fishing preserves, the pride of our cuisine. VEGETABLES IN OIL: Farmers had to conserve the harvest to last the whole year, developing the art of vegetable preserves. Following their example, we suggest a series of fragrant and tasty vegetables in oil. When talking about the history of our firm and the Bruna family then we have to go back a couple of centuries. 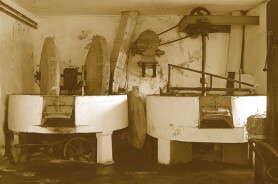 Captain Filippo Bruna, after leaving his military carrier, decided to integrate the cultivation of olive trees with the introduction of an olive mill. Since that day, both craftsmanship and passion have been passed on from one Filippo to one Vincenzo for five generations. This inestimable heritage and the love for our traditions are still today the secret of our extra virgin olive oil. The art of “making” olive oil together with our grandmas recipes have been passed on from generation to generation within Casa Bruna. The tastes of our cuisine remind us of the nature of our people, they are frank, sometimes rough, but always direct. They testify a poor cuisine, where fantasy has been transformed from necessity to virtue. It is a real casket of goodness, a culinary tradition that always fascinates and amazes with its ability in conjugating taste and lightness, as well as preserving and flavouring every product from the kitchen garden, sea or forest. Our aim is to tell you, through the pleasure of food, a piece of history. The traditions, not only of our family, but also of people who have always lived clung to this narrow spit of land between the Ligurian Sea and the Maritime Alps, kissed by the sun and swept by the wind.